I found this novel by sheer coincidence, and it happens to be one of those novels that lingered in me, Ismail Kadare, the author, is a genius. I liked it. I loved it! It was intriguing, catchy. I could not help but buy the novel when my eyes first caught sight of the title. For someone who hasn't read it they'd think it's about 'wishes', but actually the novel was all about dreams and the interpretation of them. I liked it because I'm very interested in the mysteriousness of our visions. And it indeed was what I needed. 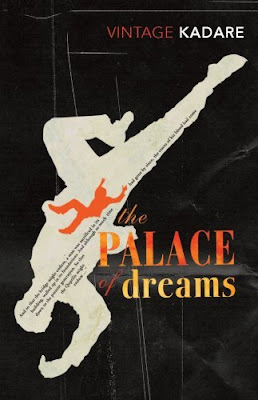 In brief: The palace of Dreams is the ruler of an Empire constructed on dreams, at the end of every year, and after selecting, analysing and interpreting every important-looking dream, they choose a master-dream and make it come true. Most-if not all, I believe- of the novel was about conspiracy and conspirator dreams that it'll make you think all of them are fabricated by the government employees to fulfill their needs in the country. The end was open and unpredictable, which was also not a bad thing at all. The protagonist. Nothing special about his person, but his silence implied something of clandestine importance. And I loved that. I would like to really really thank the translator; I know translation is such a pain and it is almost impossible to translate novels of such beauty, with the same beauty of the original version. I would like to be that good someday. "For in the nocturnal realm of sleep are to be found both the light and the darkness of humanity, its honey and its poison, its greatness and its vulnerability. All that is murky and harmful, or that will become so in a few years or centuries makes its first appearance in man's dreams. Every passion or wicked thought, every reflection or crime, every rebellion or catastrophe necessarily casts its shadow before it long before it manifests itself in real life." "It's bad enough when an individual life gets caught up in the mechanisms of power - when a whole nation is drawn in, it's a million times worse!" "That wearing interrogation night and day, that interminable report, the pretense of seeking precise details about something that by its very nature cannot be definite - all this, continued until the dream begins to disintegrate and finally disappears completely from the dreamer's memory, could only be called brain-washing, or an undream, in the same way as unreason is the opposite of reason." "One day dreams would emerge into the light of day and take their rightful place in human thought, experience and action. As for whether this would be a good thing or a bad, whether it would change the world for the better or the worse - God alone knew"
"Who can say it's not what we see with our eyes open that is distorted, and that what's described here isn't the true essence of things? Haven't you heard old men sigh that life's a dream?"